Bringing the Most Beautiful Custom Stained Glass to the Woodlands, TX. The Woodlands Texas is a beautiful master planned community a stone’s throw away from Houston. The Woodlands is nestled deep within a lovely natural forest, and its one hundred thousand plus residents are proud of their homes. This community is home to beautiful natural parks and preserves as well as cultural attractions of its own such as the George Mitchell Nature Preserve, the Woodlands Children’s Museum, and the popular Cynthia Woods Mitchell Pavillion where residents gather for concerts and more. We offer custom stained glass to the residents of the Woodlands, including residential, commercial, and religious stained glass. Residences in the Woodlands are modern and beautiful, and we make our stained glass to help make them even more so. Each and every piece of stained glass that we build is designed to our client’s specifications and tastes. That means a client can choose any style they like, any design or pattern, any colors or types of glass that will complement their décor or architecture. Stained glass brings elegance, class, a high end look, a dramatic focal point, added value, and plain old gorgeousness to any room. Clients work with one of our Houston designers and have their stained glass windows and doors built by a local Houston craftsman. They are able to support their local economy and local artisans while getting the highest quality and most stunning stained glass available anywhere in the world. Whether a client is looking for an updated kitchen with stained glass kitchen cabinet doors or more privacy in their entryway with stained glass in the entryway, including the sidelights, the front door, and any transom windows, we custom create the styles and designs that will add impact and beauty. Other popular locations in a home to add custom designed stained glass include the hallway, the bathroom, and even the basement if it is finished, but has those small and not very attractive well windows. 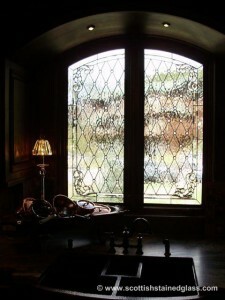 Stained glass can replace an undesirable view with something that is always appealing to look at. 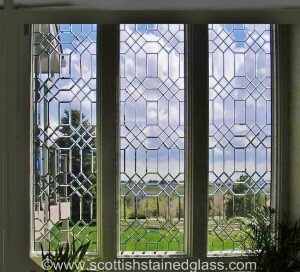 The most popular residential stained glass style is leaded and beveled stained glass. This is made with colorless frosted glass, mixed with beveled glass. It suits any color scheme and provides an elegance, classy look that doesn’t call as much attention to itself as brightly colored stained glass will. Businesses today need every advantage to remain competitive. That can include a stunning interior which creates an ambiance that clients and guests will enjoy. Stained glass windows, doors, lighting, backdrops, skylights, and more can help The Woodlands businesses take their interior design to the next level of impact. Whether looking for something that says success and elegance or something that says fun and funky, our custom designed stained glass is flexible enough to do it all. We create unique and special religious stained glass art for churches, cathedrals, temples, sanctuaries, and chapels, including home chapels. Our religious stained glass art follows the long tradition of stained glass in houses of worship around the world, featuring any images, scenes, icons, or symbols that our clients ask for.